Dolls House & Miniature Scene Magazine interview. Somehow, I completely forgot to post the interview I had back in August 2013 with the UK-based magazine Dolls House & Miniature Scene. Here’s a scan of the layout and the article. The interview was focused on my earlier project, The Disobedient Dollhouse. Click on the images below to get a larger (and much more legible) article. 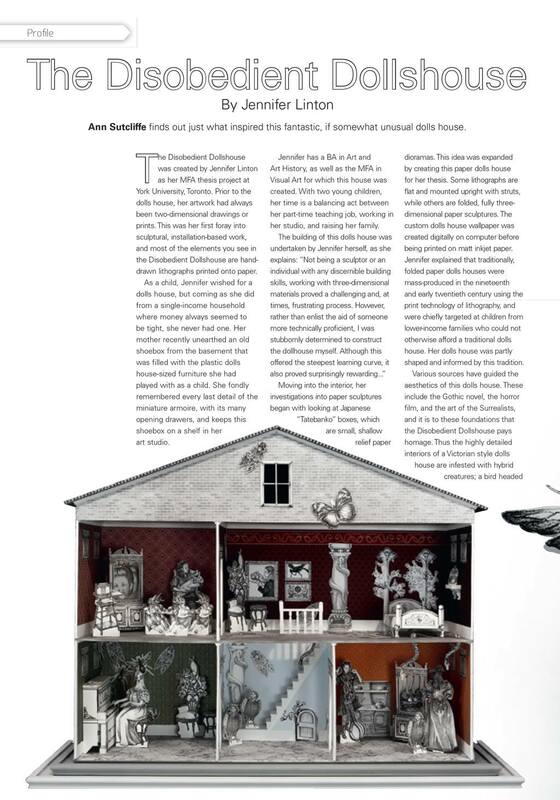 I found it amusing how the editor kept insisting on changing the title of my work to conform to the British usage of the term “dollshouse” with the plural, rather than my North American-derived term “dollhouse”. Whatever. Giant insects swarm the Art Gallery of Peterborough! Quick and dirty snapshot of the installation in-progress. 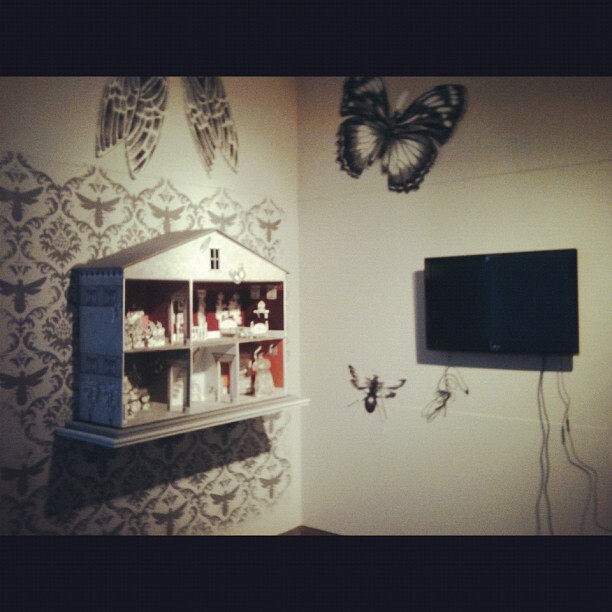 My installation The Disobedient Dollhouse will pay a visit to the Art Gallery of Peterborough, starting this month. This exhibition will also screen my 2-minute stop-motion animation Domestikia: The Incident in the Nursery. 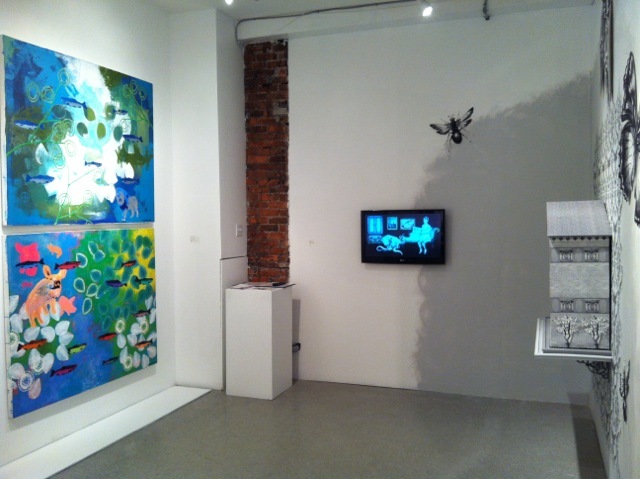 Exhibition runs from November 9 – January 6, 2013. The opening reception will take place Friday November 16, 7 – 9 pm. Visit the web site of the AGP for details and/or directions. 2010 in review according to the WordPress stats monkeys. In 2010, there were 27 new posts, growing the total archive of this blog to 31 posts. There were 79 pictures uploaded, taking up a total of 17mb. That’s about 2 pictures per week. The busiest day of the year was December 14th with 104 views. The most popular post that day was Calamari Love: the curious tradition of Japanese ‘tentacle erotica.’. The top referring sites in 2010 were facebook.com, jdlinton.50webs.com, en.wordpress.com, lunettesrouges.blog.lemonde.fr, and search.aol.com. Some visitors came searching, mostly for cannibal holocaust, loretta lux, struwwelpeter, max ernst, and ginger snaps. For many years, I was satisfied by the simple act of drawing. While a number of my colleagues relied on computer software or other technologies to produce their art, I rejoiced in the analog. Aided by a pencil and a facility for drawing, I was limited only by my imagination when creating fantastical worlds between the borders of my paper. And then, one day, I wondered how my fantastical worlds would appear were they freed from their paper borders and delivered into our three-dimensional world. Tatebanko is the Japanese art of creating dioramas and scenic perspectives from paper. It was popular and widely admired from the 17th century to the early 20th century. The desire to see my drawings projected into space began, nearly two years ago, with a moment of pure serendipity. While checking my email, an advertisement for an ‘arts & crafts’ store landed in my inbox that offered Japanese paper dioramas for sale. 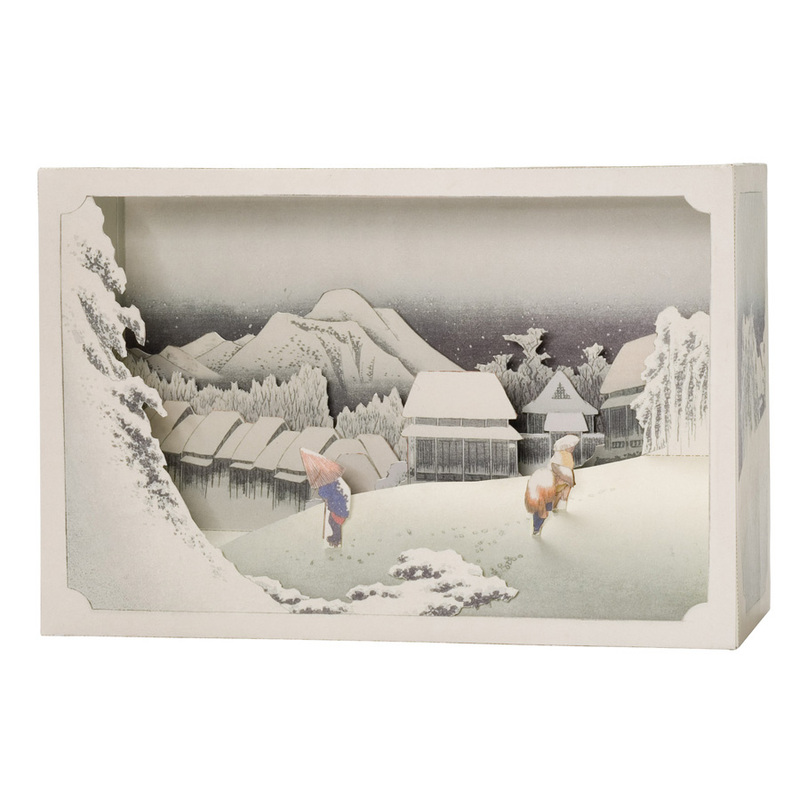 These paper dioramas – known as tatebanko in their native land – are small boxes containing flat, printed paper elements that are folded and glued into miniature tableaux. I grew instantly curious. The shallow relief of the tatebanko provided the perfect stage upon which to mount my drawings and project them into space. As an artist who also works in print media, I could use printmaking techniques to generate multiples that could be cut out, folded and glued. I decided that the box diorama was an obvious next step in the evolution of my hitherto two-dimensional art practice, enabling me to consider space and volume with relative ease. In the months that followed my virtual encounter with the tatebanko boxes, my project grew in both size and scope. My initial concept of a box diorama expanded into the much larger and more complex construction of a dollhouse, a toy fondly remembered from my childhood. Revisiting the dollhouse in adulthood, myself a parent, has proven a psychologically rich and poignant exercise. In stark contrast to the innocuous role-playing of childhood – when one could ‘play Mommy’ – as an actual parent, the actions I take have real life consequences. This simple fact can, at times, be the cause of anxiety. Additionally, while the household provides a peaceful refuge from the hectic pace of the outside world, the daily negotiations between career aspirations and familial responsibilities simultaneously render the house a site of friction and conflict. An exploration of the conflicts that arise from these competing interests was, in part, the impetus behind my dollhouse project. Domestic conflict aside, the physical construction of the dollhouse presented the greatest degree of friction and conflict during its creation. Not being a sculptor or an individual with any discernible building skills, working with three-dimensional materials proved a challenging and, at times, frustrating process. However, rather than enlist the aid of someone more technically proficient, I was stubbornly determined to construct the dollhouse myself. Although this aspect of the project offered the steepest learning curve, it also proved surprisingly rewarding to begin to understand and address the special demands of my chosen building materials. Whereas at the start of this project, I viewed the dollhouse solely as a devise for the display of my drawings, by its conclusion, I gave equal consideration to the dollhouse as an object unto itself. This newly found appreciation for sculptural space was, for me, the most pivotal and profound moment of the creative process. Yet another surprising discovery was the quality of play I found in working with the cut out lithographs. Having printed multiples of the same drawing meant that I was able to explore different arrangements of the same graphic elements. With my drawings freed from the static plane of the paper, I could experiment with composition, contextualizing and re-contextualizing with each new grouping of images. A folded paper wardrobe in one room, for instance, appears subtly altered when combined with different objects in another room. This quality of ‘play’ not only proved enjoyable, but also highly appropriate given the framework of a dollhouse. Within the body of this paper, I reveal and discuss the various sources that have guided the aesthetics of my project. These sources – which include the Gothic novel, the horror film, and the art of the Surrealists – have shaped not only this project, but have greatly informed my artistic practice to date. It is to these sources that the Disobedient Dollhouse pays homage. — Gaston Bachelard, The Poetics of Space. The image that appears in my mind when I meditate on the word “house” is not a recreation of the family home of my childhood, nor is it a straightforward rendering of the house in which I currently dwell. Rather, it is an amalgamation of all the houses in which I’ve lived, blended together with the houses belonging to friends, and the houses I’ve vicariously experienced through films or books. This is the composite house of my dreams, a grand and expansive place with numerous corridors and hidden rooms. The space within my imagined house is infinite in scope. Doors from great hallways lead into small rooms, each presenting more doors which, in turn, lead to progressively smaller rooms, stacked into each other with the artful precision of a Russian matryoshka nesting doll. The endless replication of interiority in my imagined house, unlike that of the nesting doll, has no physical limits. Space as it is experienced through the psyche is boundless. Mine is an oneiric house – a house of dreams – similar in nature to the one conjured by philosopher Gaston Bachelard in his text Poetics of Space, built not from bricks-and-mortar but constructed from layers of memory and experience. According to Bachelard, my every experience with the phenomenon that is “house” is imbued with a deeply personal, psychological resonance derived from the memory of the very first house of my childhood. While I do support Bachelard’s claim that the childhood home is fundamental to the psychological mapping of the oneiric house, I would graft onto his argument the importance of the towers of fairytale castles and the cobwebbed elegance of aristocratic manors that so often provide the setting for Gothic narratives in film and literature. These majestic dwellings, while considerably more grandiose and romantic than the humble home of my childhood, are nonetheless formative to the house of which I dream. The mysterious interior of my oneiric house – the one of endless doors and dark, secret passageways – owe as great a debt to these traditions of literature and film as it does to my own personal, lived-in experience with a physical house. It is this house, this strange amalgam of the real and the fantastic, that I strive to conjure in my project entitled the Disobedient Dollhouse. Granting form and substance to my house of dreams has proved a daunting task. The infinite space of the dreamscape, with its ever-shifting walls and limitless rooms and doors, defies reproduction in the static world of the real. At best, my aim to is achieve some sort of compromise with the infinite. Thus, I have sought to make this compromise concrete through the creation of a miniature toy house: a dollhouse. My fascination with dollhouses began, predictably, in childhood. Though I was never fortunate enough to own a dollhouse, I did possess several pieces of plastic miniature furniture that I would fastidiously arrange into rooms. These rooms provided the setting for the domestic scenes myself and my playmates would enact with our dolls – scenes that mimicked the day-to-day household routines of our mothers. This form of play amongst young girls – where we would ‘play house’ and pretend to be ‘the Mommy’ – was not only an imitation of the maternal role as we observed it, but, presumably, constituted a type of practice for our future lives as women. Now, as an adult, artist and mother, I revisit the dollhouse. The idealized view of domesticity that informed my childhood dollhouse is reconfigured by my adult self as a place much more complex, even contradictory in nature. These darker, more nuanced shadings find expression in the ‘gothic’ elements of my dollhouse. A dollhouse is a gendered space, one specifically codified as feminine. Literary critic Susan Stewart defines the dollhouse as a “discourse of the ‘petite feminine’” that yearns to see itself replicated in a tiny, precious model of perfect domesticity. Developed in the 17th century as an amusement solely intended for adults, it served as a trophy of the wealthy European woman. Given the rise in popularity of dollhouses in 18th century Europe, at a time in history when women’s roles were increasingly confined to the home, it is tempting to draw a correlation between this change in gender-based codes of conduct and the miniature toy house that reinforced a woman’s role as being solely defined by her place within the house. Her fantasy of a microcosm over which she held complete control – in a world in which she held little or no political control – played out through the choreography of furnishings in her miniature rooms. Unlike the traditional toy object, the staged interiors of the dollhouse were not meant to be manually played with but rather to be “consumed by the eye” as an object of display. As such, the dollhouse was modeled as a shrine to an idealized domesticity, forever unsoiled by the grimy reality of daily living. Nostalgia is characterized by a sense of yearning, either for one’s own past or for an imaginary past located somewhere in history. Yearning constructs a view of the past that is sentimental in nature, and the dollhouse is a manifestation of this essentially romantic construction. There are no shoeless Dickensian street urchins haunting the perimeters of a Victorian-themed dollhouse; these are sumptuous interiors fuelled by fantasy and free of social critique. A trace of nostalgia can be discerned in my Disobedient Dollhouse, evidenced by the Victorian-style decoration and furnishings, as well as in the clothing worn by some of its inhabitants. An old-fashioned cast iron cook-stove is represented in the kitchen. The parlor room prominently features an upright piano, an entertainment staple in many wealthy Victorian households. The era’s obsession with detail is fully on display in the intricately patterned wallpaper that adorns each room of my dollhouse. Fig. #1. Odilon Redon. "The Crying Spider". 1881. Lithograph. Not only do the furnishings and other contents express nostalgia, but the medium by which many of these contents were produced – namely the medium of stone lithography – is itself informed by nostalgia. The printmaking process of stone lithography enjoyed enormous popularity amongst visual artists in the 19th century, particularly during the later decades of that century. 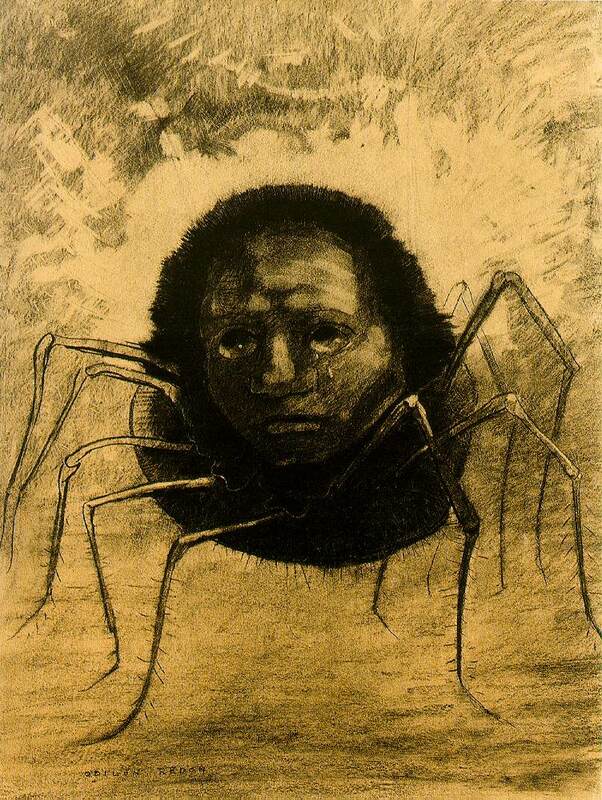 Hence, the formal characteristics of the medium carry a heightened association to print-based artwork produced during the Victorian era, particularly amongst fin-de-siècle artists such as Odilon Redon (fig. #1) and Edvard Munch. As a contemporary visual artist, producing a body of work using stone lithography is an especially purposeful act. Against the backdrop of the 21st century digital age, where images can be instantly produced and replicated with the click of a computer mouse, the physically arduous medium of stone lithography – which involves sanding and drawing onto a heavy slab of limestone – is comparatively anachronistic. At a time in history when images can be more easily obtained by photographic or digital means, the act of drawing and reproducing images with stone lithography carries with it a quality of nostalgia. By using this “nostalgic” print technology, my intention is to formally recall the style and design of Victorian art, and in particular the grotesque and macabre imagery of Victorian artists like Redon and Munch. While a trace of nostalgia is detectible in the Disobedient Dollhouse, a tension also exists in the work that simultaneously disrupts the easy consumption of these same nostalgic images. The word “disobedient” contained in the title summons an image of a stubbornly defiant child who refuses to submit to a higher authority. Against which authoritative structure does my dollhouse rebel? In part, it is the force that drives the nostalgic impulse – the urge to construct a sentimentalized view of domesticity – that compels my dollhouse to revolt. A tactic of subversion has been employed as a means of rebellion. For instance, although the conventional Victorian domestic scene of a woman playing piano has been dutifully rendered, the woman depicted is a hybrid creature with the head of a bird. A chair located in the same room as the bird-headed woman mysteriously sprouts twisted floral vines that snake up the back wall. Gigantic insects infiltrate the room and swarm across the ornate damask wallpaper like a strange, inexplicable virus. These hybrid monsters, giant insects and fantastic vegetal growths disturb the inherent sentimentality of nostalgia and propose a dark, secret world that churns just beneath the veneer of domestic perfection. 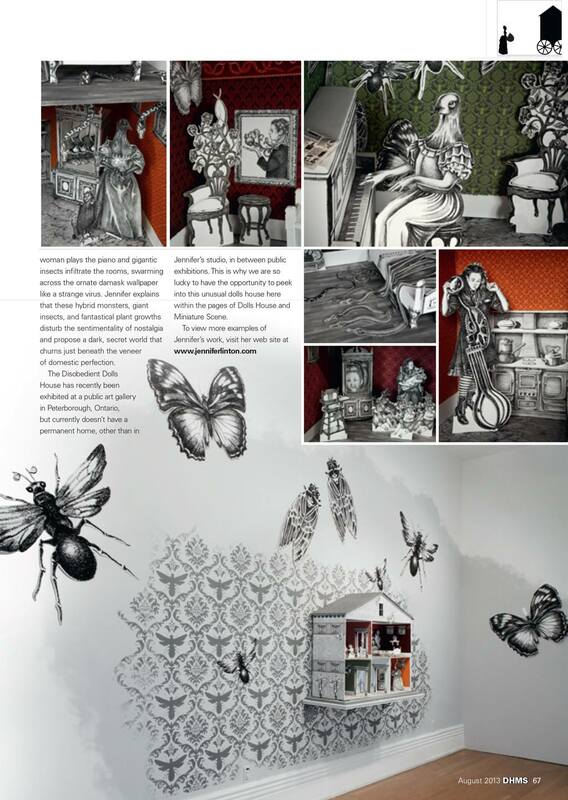 The concluding chapter of my essay on the Gothic aesthetic and my thesis project The Disobedient Dollhouse. These excerpts from my thesis began with The Gothic House and The Abject…, respectively. Fig. #8. Jennifer Linton. Detail from the "Disobedient Dollhouse", 2009-10, lithograph. Poised amongst the brood of bird-children sits the nanny, a character within my Disobedient Dollhouse that was modeled after myself. Downstairs in the kitchen, a second version of ‘myself’ cast as the household cook struggles with an absurdly large cooking utensil. These characters are the result of an amalgamation of Gothic heroines I have borrowed from sources such as Charlotte Brontë’s Jane Eyre and, most especially, Lewis Carroll’s Alice from Alice’s Adventures in Wonderland. Costumed in a fashion reminiscent of a Victorian girl, my ribbon bonnet, puffed sleeves and crinolined skirt (fig. 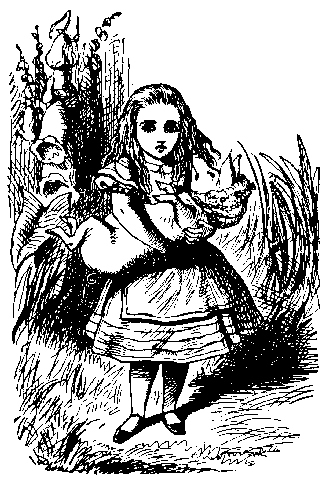 #8) recall the famous wood engravings of Alice by British illustrator John Tenniel. By incorporating my own image into these characters, I have effectively embedded myself within this miniature world. This role-playing is one of the creative strategies I employ in order to generate a private mythology. Throughout my visual art practice, I have used various legends and myths as cultural ready-mades into which I introduce my own personal symbolism and meanings. Over the years, these pre-existing myths have been absorbed into my artistic lexicon, contributing to a complex language of symbols by which I construct a private mythology. Myths supply an accessible and universal narrative to which I can attach my idiosyncratic story. Fig. #9. Jennifer Linton. "The Bitter Seed", 2000, coloured pencil and ink on Mylar. Renowned scholar and mythologist Joseph Campbell describes one of the goals of myth as “…effecting a reconciliation of the individual consciousness with the universal will.” Similarly, in his essay “The Expressive Fallacy” Hal Foster cites Nietzsche’s discussion of an artist’s use of myth to express an interior world: “The whole notion of an ‘inner experience’ enters our consciousness only after it has found a language that the individual understands – i.e., a translation of a situation into a familiar situation…” The “language” to which Nietzsche refers can be interpreted as “mythology” which provides a universal narrative to which all cultures, no matter how disparate, have access. The “inner experience” may be read as the personal, psychological or emotional world that the artist seeks to materialize through the use of myth. In short, myths connect us to each other by anchoring the idiosyncrasy of the individual to a universally shared point of reference. The construction of a private mythology is a procedure that allows an artist to explore deeply personal and intimate subject matter while simultaneously maintaining a level of psychological distance. In my own work, I employ the strategy of role-playing as a means to address autobiographical content. In an earlier body of work entitled The Bitter Seed (fig. #9), I combined images of myself as a child with the character of Persephone, a heroine borrowed from Greco-Roman mythology. By adopting the role of Persephone, I universalized the idiosyncratic – depersonalizing the personal content. This process provides a psychological distance while simultaneously rendering the work more readily accessible to the viewer. To the ancient Greeks, the myth of Demeter and Persephone served to explain the death and regeneration of plant life each year. Persephone personified the cycle of the seasons through her annual sacrifice. Fig. #10. Jennifer Linton. Detail from the "Disobedient Dollhouse", 2009-10, lithograph and digital image. A pomegranate motif appears repeatedly throughout my Dollhouse. A highly stylized version of this fruit is featured in all of the stained-glass windows, and pomegranates adorn the wallpaper of the bedroom and the head and footboard of the bed. Two of the framed, miniature pictures that hang on the bedroom wall also contain the pomegranate. One of these framed pictures features a self-portrait, in which the curly locks of my hair transform into undulating, snake-like vines (fig. #10). These vines terminate in a single pomegranate, delicately suspended above my open palm. 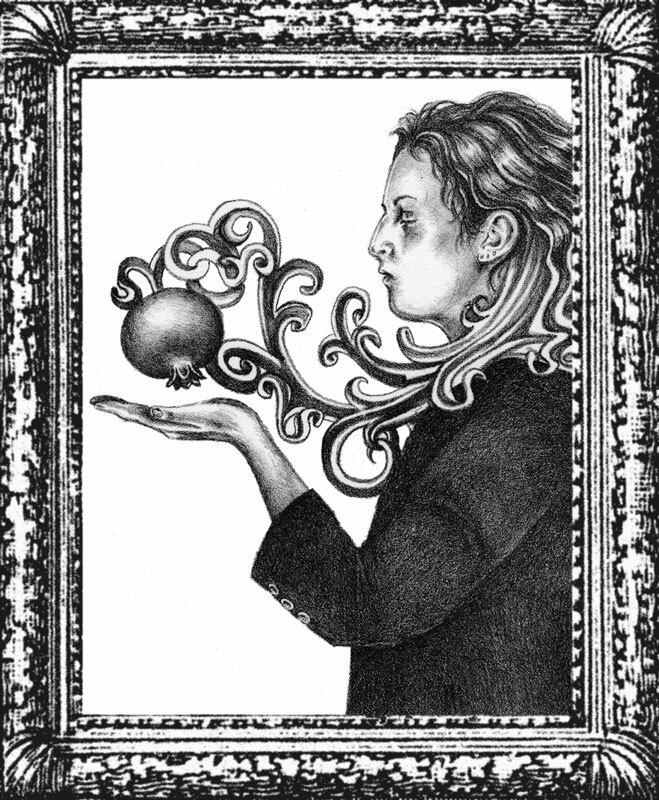 This self-portrait, however, makes only a vague reference to the pomegranate from the Persephone myth. Within the narrative of my current project, I no longer inhabit the role of this Greco-Roman goddess. The pomegranate serves not as a symbol of sexual subjugation – as it does within the Persephone myth – but rather as a symbol of female empowerment. The partially opened vulviform shape evident on the pomegranates throughout the Dollhouse make the linkage to female sexuality quite explicit. Whenever an artist includes self-portraiture, the temptation for the viewer is to read autobiographical content into the work. Such is the case in my work, although this content is largely mediated through my use of symbolism and mythology. The grotesque and dreamlike imagery of the Disobedient Dollhouse obscures any straightforward reading of autobiography, softening the distinction between ‘the invented’ and ‘the real’ elements. The dark, psychologically tumultuous material that the Gothic would seek to conceal, and the Freudian psychoanalytic model to repress, my Dollhouse opts to place on display, albeit cloaked in myth and symbolism. Blurring the boundaries between ‘the invented’ and ‘the real’ through the creation of a private mythology was a strategy often employed by artists who subscribed to the idiom of Surrealism. The fantastic and frequently grotesque imagery of Surrealist art closely relate to my Dollhouse’s otherworldly and Gothic-inspired content. In fact, the aims of Surrealism – to question rationality and uncover sublimated fears and desires – seem to echo the urge of Gothic novelists like Brontë to expose the concealed darkness of the human psyche. “Surrealism and the Gothic share a decisively anti-Modernist stance,” wrote curator Christoph Grunenberg, “rejecting Modernism’s emphasis on order, rationality, and purity.” One of the most ‘gothic’ practitioners of Surrealism – and an artist whose work was dedicated to the manufacture of a private mythology – was the visual artist Max Ernst. These are the same dramatic, sinister and darkly romantic themes that typify Gothic fiction. Ernst’s disjointed juxtapositions only served to amplify the already emotionally charged content of his source material. Fig. #11. 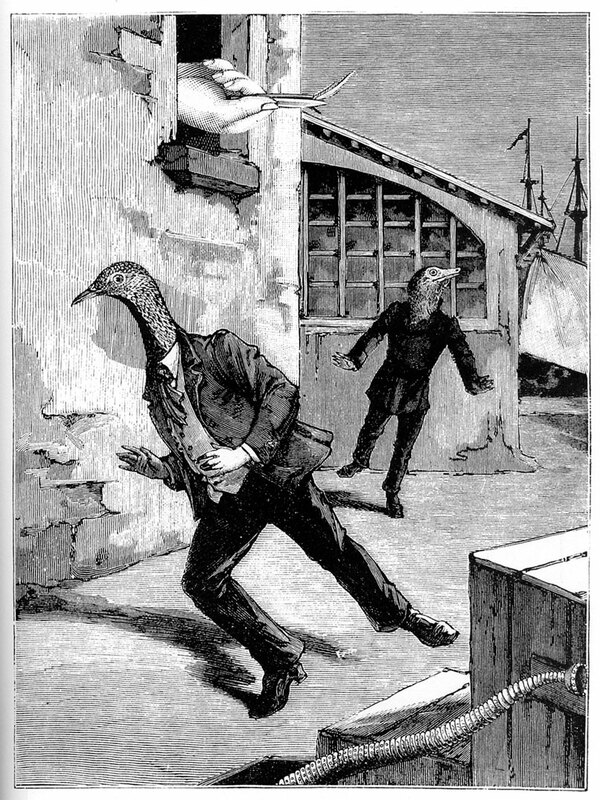 Max Ernst. Illustration from the novel "Une Semaine de Bonté", 1933, engraving based on collage. 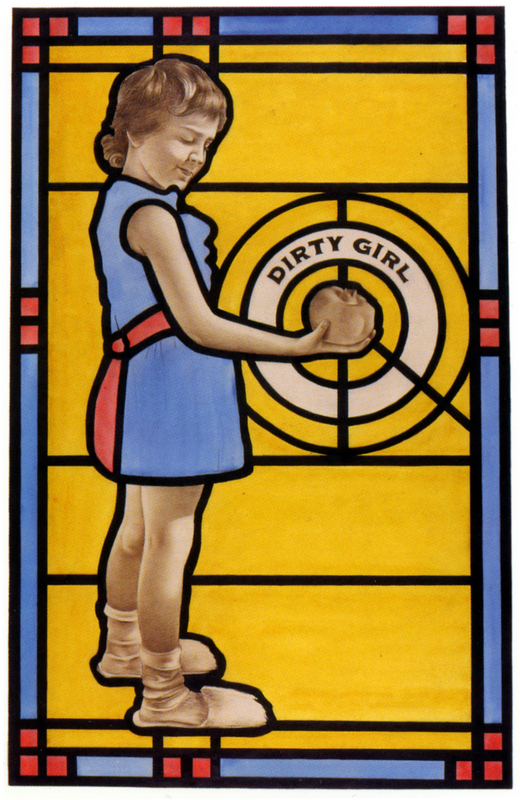 Ernst’s motivation behind this conflation of his art and autobiography remains unclear. While writers such as Werner Spies describe Loplop as an “autobiographically tinged bird-creature”, there remains a degree of mystery surrounding Ernst’s personal attachment to his alter-ego. His complex vocabulary of recurrent symbols and characters, including the omnipresent Loplop, may have been more the result of a Surrealist intellectual game than a deeply personal expression of psychological catharsis. Driven by a fascination with psychoanalysis, Surrealist artists like Ernst frequently engaged in game-playing as a means to access the random machinations of the unconscious mind. The technique of collage was particularly well-suited to this end. Thus, Ernst’s juxtaposition of disparate images, such as a male figure topped with a bird’s head, could well be the result of his Surrealist investigations into randomness. Regardless, inspired by the psychoanalytic writings of Freud, his private myth-making created a forum in which he unearthed and explored the repressed material of the human psyche. The bird-headed women that populate my Disobedient Dollhouse can be viewed as the great-granddaughters of Loplop. Female counterparts to Ernst’s invariably male creation, they inhabit a similarly enigmatic role. While it is enticing to read these bird-women as extensions of myself, this close association remains ambiguous. My own image is represented in the appearance of the ‘nanny’ and ‘cook’ characters. Cast in these roles, my social status within this world appears subservient to the two bird-headed women, one of whom leisurely plays at the piano. Has my character/s been enslaved by these menacing creatures and forced to care for their offspring while they lounge? Given my real-life status as artist, wife, and mother, one could easily attach this autobiographical reading. Caution should be exercised, however, to interpret these images too literally. Similar to the private myth-making of Max Ernst, my work contains as much theatrical artifice as it does legitimate psychological exploration. Steeped in dramatic excess, my Dollhouse is self-consciously prone to hyperbole. The genesis of my bird-women has little to do with Surrealist explorations of the unconscious mind, but instead, are visual evidence of my recent interest in dioramas. In fact, the figure of the bird-woman holding the skeletal rodent was not only the very first image I created for this project, but she derived entirely from a taxidermy diorama I viewed online at the A Case of Curiosities web site. Anthropomorphic taxidermy dioramas were a strange passion of the Victorians. Walter Potter, one of that era’s most celebrated practitioners of this macabre art form, was renowned for his complex and large scale tableaux such as his Kittens’ Tea & Croquet Party (fig. #12). The ghoulish spectacle of Potter’s taxidermy dioramas neatly encapsulates the type of grotesque art to which I am drawn as an artist, and therefore, it is not the least bit surprising that these provided the creative ‘jumping-off point’ for my dollhouse project. The hybrid bird-women and host of other grotesques that populate my Disobedient Dollhouse represent the wild, unruly and random elements of the psyche that stubbornly resist the process of repression. The nostalgic impulse that seeks to construct a too-perfect version of the past – one that suppresses the ‘dark family secret’ or other psychologically troubling material – is thwarted by these defiant monsters. The idyllic view of domesticity generated by nostalgia rejects the ugly, soiled, imperfect and dissonant. This romanticized construction is illusory and cannot be maintained. Shaken to its very foundations by the uncanny creatures that swarm its interiors, it will inevitably falter and collapse like the ill-fated House of Usher. Moviegoers have flocked, myself included, to horror films like The Haunting in order to vicariously experience the eerie and macabre. What is it about these frightening experiences that we find so intriguing? Much like the malevolent spirit of Hill House that beckoned to Nell, we feel urged by an inexplicable force to seek out the locked doors, hidden rooms and dark, mysterious corners of the Gothic house. The more we have been instructed by the rationality of science to reject the nonsensical, the superstitious, the absurd and otherworldly, the more we seem compelled to seek these out. The shadowy interiors of these cinematic and literary haunted houses have significantly shaped the construction of my oneiric house, the one that I dream with the endless doors and secret passageways. They also inform the grotesquery of my Disobedient Dollhouse. Rather than reject the absurd and uncanny, my Dollhouse celebrates it. A continuation from my previous post, The Gothic House. — The character of Jonathan Harker from Bram Stoker’s 1897 novel Dracula. Any analysis of the term ‘gothic’ will inevitably conjure its related terminologies: the ‘abject’, the ‘grotesque’, and the ‘uncanny’. By its very nature, the Gothic contains elements of each of these terms, although it maintains a separate and very distinct character. All three of these terms find a varying degree of expression within my Disobedient Dollhouse. The first term ‘the abject’ was coined by the psychoanalyst Julia Kristeva in her seminal essay entitled Powers of Horror: An Essay on Abjection. Abjection is primarily concerned with societal taboos surrounding the materiality of the body, and the horror that arises from exposure to bodily excretions such as blood, pus and feces. For example, the horror associated with blood is a central theme to Bram Stoker’s Dracula, the classic Victorian Gothic novel in which the legend of the vampire is powerfully invoked. In Powers of Horror, Kristeva classifies the corpse as representing the utmost in abjection: “[The corpse] is death infecting life. […] Imaginary uncanniness and real threat, it beckons to us and ends up engulfing us.” When confronted with a corpse, we are forced to address our own mortality and the inevitable corruption of our own bodies. Fig. 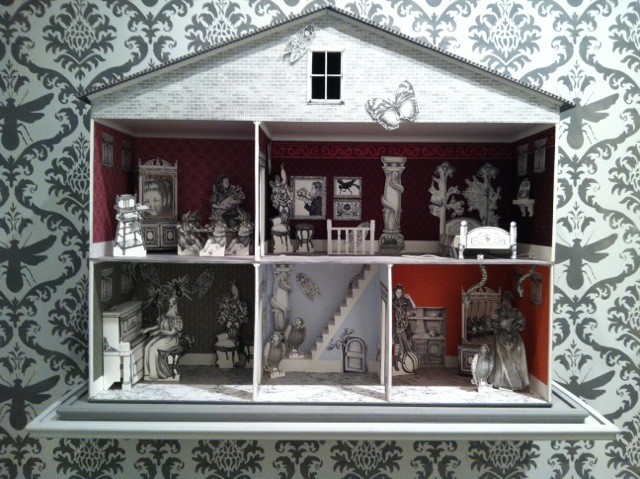 #5 - Lithograph from "The Disobedient Dollhouse", Jennifer Linton, mixed media installation, 2009-10. The abject is clearly present within my Disobedient Dollhouse. A group of dead mice hang by their tails inside a kitchen cabinet, presumably providing a food source for the other inhabitants of the Dollhouse. A sinister bird-headed woman stands before the cabinet, clutching the tiny, skeletal remains of a rodent-like creature (fig. #5) While this scene does not contain any signs of blood or viscera, these small rodent corpses offer the presence of violent death, thus contributing to an atmosphere of abject horror within this Victorian-style dollhouse kitchen. Although animal and not human, these tiny corpses nevertheless serve as potent reminders of our own eventual demise. Fig. #6. John Tenniel. Illustration for Lewis Carroll’s "Alice’s Adventures in Wonderland", 1865, wood engraving. 19th century illustration for Carroll’s novel by John Tenniel depicting Alice holding a bonneted baby pig (fig. #6). The monstrous brood housed inside my nursery – heads tilted up with beaks wide open, their arms thrust outwards in a gesture of relentless, constant need – represent every parent’s nightmare of unending responsibility. The parental anxiety symbolized by this scene has been tempered, however, by an element of the absurd. Much like the ridiculously grotesque image of the bonneted pig held by Alice, my bird-headed children are designed to elicit equal measures of pathos, humour and horror. My nursery most assuredly conveys parental anxiety, but it does so with tongue firmly planted in cheek. After her initial transformation, Alice consumes a cake labeled ‘EAT ME’ and shoots upwards in the opposite direction, growing large so suddenly that she becomes trapped within the house. The accuracy of scale within a dollhouse creates a sense of realism. Hence, when a deviation from scale occurs, the illusion of reality is severely comprised. Similar to Carroll, I have adopted elements of ‘the grotesque’ in my Disobedient Dollhouse by playing with the scale of objects. In fact, several deviations in scale exist. In the kitchen, in the guise of the household cook, I attempt to wield a gigantic eggbeater that stands as tall as my miniature self (fig. #7). The exaggerated difference in size – plus the fact that, undaunted, I continue to struggle with the giant kitchen utensil – heightens the grotesque absurdity of this scene. Fig. 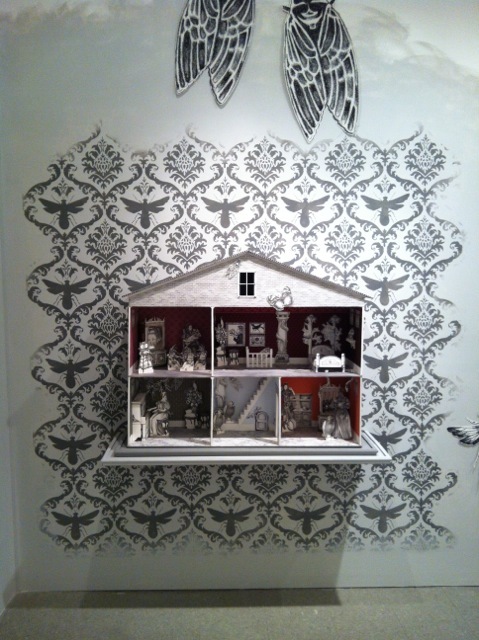 #7 - Lithograph from "The Disobedient Dollhouse", Jennifer Linton, mixed media installation, 2009-10. One creature that appears repeatedly throughout my Dollhouse is the insect. Changing the size of the insect, as well as the context in which the insect is received, is a simple gesture that invokes ‘the grotesque’. Initially, I drew these insects to actual scale from specimens found in a local museum. When placed on the walls of my Dollhouse, however, these same insects suddenly appear gigantic in relation to the miniature scale therein. This change of context – from a normal sized insect in our world to a gigantic one in the miniature world – alters the perception of these creatures from ordinary to grotesque. When these same insects are scaled up, appearing as giants that loom over the viewer within the gallery space, this encounter with the grotesque is further intensified. As the contents of the Disobedient Dollhouse emerge into the surrounding exhibition space, the viewer becomes immersed in its fantastic world – no longer a mere observer but a full participant in its alternate reality. An encounter with giant insects on a gallery wall – insects made strange by the fact of their surprising scale – can be classified as an encounter with ‘the uncanny’, the third and final of the terminologies related to ‘the Gothic.’ Our present day understanding of the term ‘the uncanny’ has been largely shaped by the psychoanalytic viewpoint of Sigmund Freud’s 1919 seminal essay entitled “The Uncanny”. In his essay, Freud defines the uncanny experience as: “that class of the frightening which leads back to something long known to us, once very familiar.” To experience something as ‘foreign, and yet familiar’ may result in feelings of discomfort and alienation. In this regard, the concept of ‘the uncanny’ is closely related to Julia Kristeva’s theory of abjection – in which the human corpse can be simultaneously experienced as alien (the abject) but also felt to be strangely familiar (an individual, now deceased). Freud situated ‘the uncanny’ in the realm of the repressed: “[The uncanny] is in reality nothing new or alien, but something which is familiar and old – established in the mind and become alienated from it only through the process of repression.” According to the Freudian psychoanalytic model, the process of repression involves the rejection and subsequent suppression of troubling impulses and desires. The concept of repression closely relates to the suppressed ‘family secret’ frequently found within the Gothic narrative. Whereas the Gothic ‘family secret’ manifests in the guise of a vengeful ghost, repressed desire assumes the form of the uncanny person or object. In his essay “The Uncanny,” Freud analyzes the etymology of ‘unheimlich,’ the German word for ‘uncanny.’ His analysis proposes a strong linkage of ‘the uncanny’ to the domestic setting of the home. The German term das Heimlich signifies that which feels homely, comfortable and familiar. The inversion of this term, das Unheimlich, negates this feeling of comfort and suggests an estrangement or feeling ‘not at home,’ literally ‘unhomely.’ Through the process of repression, the safe haven of the home becomes ‘self-haunted’ by ghosts of the unconscious, a phenomenon that transforms the otherwise comfortable and familiar setting into a place that feels inexorably strange. The “private and secure sphere” of the home becomes the site of internal conflict, where the repressed are stowed away in hidden rooms, behind locked doors, in attics, closets and cupboards. Ultimately resisting suppression, the repressed reemerge as the ‘uncanny’ and transform the home into a strange and frightening place. The ‘uncanny’ appears throughout my Disobedient Dollhouse in the strange and otherworldly transformations. The bed – that most psychologically potent of symbols – literally boils over with desire and sprouts flowers from the elongated bedposts. Snakes emanate from the tousled bed sheet and slither across the floor, penetrating the wooden floorboards and sinking into the room beneath. These uncanny transformations hint at a secret world of sublimated desire, resistant to the forces of repression that are compelled to hide them away. Like the ‘madwoman in the attic’ of Charlotte Brontë’s Jane Eyre, they periodically escape imprisonment, only to wreck havoc in the realm of the conscious. The following text is an excerpt from my Master’s thesis written, in part, on the topic of the Gothic aesthetic. I felt that this chapter of the paper might be of particular interest to those that read this blog. 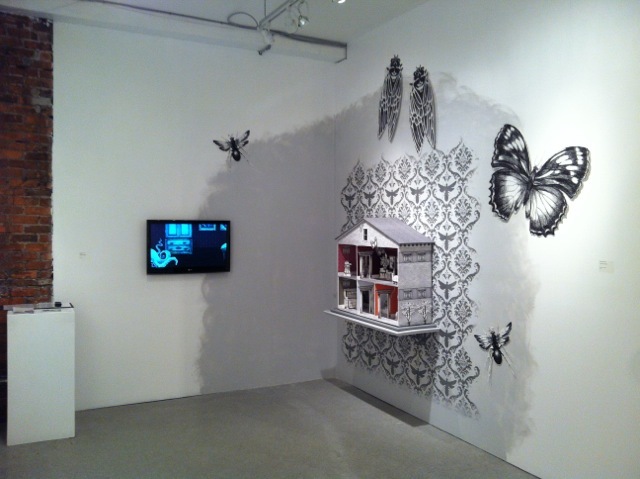 The “Disobedient Dollhouse” project to which I make reference was the visual art component of my MFA thesis. To view images from this project, click on the Gallery page located above the header of this blog. Enjoy. I confess to being an avid fan of gothic horror films and ghost stories, a confession that may not seem overly surprising given the content of my work both past and present. The castles and aristocratic manors that I mentioned earlier as being critical to the formation of my ‘house of dreams’ arise from these sources (fig. #2). The heightened theatricality of a medieval cathedral, castle or historic manor has been incorporated into my oneiric house and translated into its endless doors and dark, secret passageways. The term ‘gothic’ that I use to specify a certain subgenre of horror fiction refers not to the tribes of ancient Germanic people from whom the name originally derived, nor is it related to the medieval art that also bears this name. Instead, the term derives from a chiefly British literary genre of the 18th and 19th centuries, originating with Horace Walpole’s 1764 novel entitled, appropriately enough, The Castle of Otranto: A Gothic Story. Gothic literature combined elements of both horror and romanticism and its themes typically involve death, ghosts, the supernatural, transgression, patriarchy and the female heroine. Much like the staged interior of a dollhouse, the Gothic novel reflected a similar tendency towards the staged and theatrical. Gilda Williams, editor of the contemporary art anthology The Gothic, described ‘Gothic’ as “a studied, adopted stance,” that is “cultured, sensual and affected”, a description that concisely captures the Gothic’s propensity for dramatic hyperbole. Fig. #2. Film still from Robert Wise’s 1963 The Haunting. In the dramatic conclusion, the moral and spiritual decay of the Usher family physically manifests in the destruction of the house itself – the building literally splits in two and sinks into the surrounding landscape. Fig. #3. Jennifer Linton. Detail from the Disobedient Dollhouse, 2009-10, mixed media. The structural features belonging to my Disobedient Dollhouse, while not as malevolent as those of the House of Usher, share some of the qualities of anthropomorphism and otherworldliness with its literary antecedent. Reminiscent of the “eye-like” windows of Poe’s creation, the windows featured on all of my exterior-facing walls are comprised of a stylized stained-glass pomegranate design that closely resembles the slit-shaped eye of a cat. These “cat’s eye” windows – all of them grouped in pairs – are most clearly evident from the brick exterior of the dollhouse, where they stare out, unblinking, at the viewer. 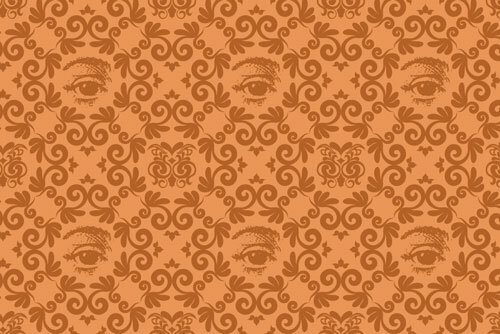 Additionally, a repeating pattern of disembodied eyes gaze outward from the wallpaper of the kitchen (fig. 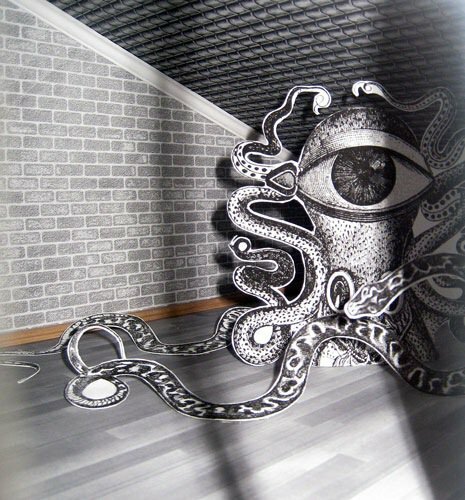 #3), suggesting that the house itself bears witness to the strange events that are unfolding within. Upstairs on the wallpaper in the nursery, a legion of tiny, open mouths appear to silently scream in a gesture that mimics the endless squawking of the bird-children that inhabit this room. Much like the sentient house of Poe’s story, these anthropomorphic elements propose a house possessed of consciousness – one that not only contains supernatural events, but may also be the generator of them. The desired effect I aim to achieve is a disquieting exchange between the Dollhouse and the viewer, as the walls of the dollhouse uncannily return their gaze. The crowning glory of any Gothic house is, of course, the attic. Similar to its close relative the cellar, the attic is a mysterious and seldom-used room where items – both material and psychological – are stowed away. The attic located within Bachelard’s oneiric house is a place of light and rationality, whereas he characterizes his cellar as the “dark entity of the house” that “partakes of subterranean forces” of the irrational, unconscious mind. In an inversion of Bachelard’s house, the attic that tops my Dollhouse is a shadowy place that offers a single window through which the dark interior may be viewed. Following the convention of most contemporary dollhouses, a cellar room is not represented in my Dollhouse, although the small cupboard door beneath the stairs – through which vine-like tentacles emerge from darkness – seem to hint at the “subterranean forces” present in Bachelard’s cellar. Peering through the attic window, the viewer encounters a snake-tentacled monster with a single, gigantic eye returning their gaze (fig. #4). This strange Cyclops is positioned slightly off-centre and is thus partially obscured by the outer wall, the bars of window frame, and the darkness within. The very purposeful positioning of this creature follows the time-tested horror film adage that “a monster you can’t see is scarier than one you can”, granting the viewer only enough information to understand that something sinister lurks within this space. Fig. #4. Jennifer Linton. Detail from the Disobedient Dollhouse, 2009-10, mixed media. The attic is the only enclosed room within my Dollhouse, allowing a very limited access to its interior. As such, it is the most private and mysterious of all the rooms. If I imagine myself descending from the attic onto the second story of my Dollhouse, where the nursery and the bedroom are located, the level of privacy compared to the attic decreases. While a bedroom is generally considered a very private and intimate space, the contents of my bedroom are fully on display, thus negating privacy. One of the crucial features of a dollhouse is the lack of complete enclosure of the miniature, thereby admitting access to its interior. This access facilitates play in a children’s dollhouse, and allows for display in the dollhouse designed for adults. Whereas the ground floor and second story of my Dollhouse adopt this convention of display, the enclosed attic rejects it. Whatever monsters and dark, troubling secrets hide within its shadowy corners, the attic will not reveal too readily. In this regard, the attic is the most “disobedient” of all the rooms. The dusty and cobwebbed attic, dark and infrequently visited, provides the optimal place in which to discard the disused, unwanted, and the surplus. It can supply storage space for the cherished items of the past, no longer in use, as well as a hiding place for family secrets and other psychologically troubling material. The attic is a quintessentially ‘gothic’ space, where suppressed secrets threaten to rise up like a vengeful ghost. Given that my Disobedient Dollhouse is a Victorian-themed dollhouse, it is not difficult to imagine all of the wild, violent passions forbidden by that era’s strict social codes might be banished into the hidden corners of this room. Concealed family secrets that slowly reveal themselves, threatening to unravel the apparent order of the household and causing a “…forced reckoning with a long buried piece of family history” is a classically Gothic trope. Like the ‘sentient house’, whose malevolence has assumed solid form within the structure of the house itself, the Gothic ‘family secret’ often physically manifests as an individual, or a ghost. In Poe’s Fall of the House of Usher, the ghost of Madeline Usher rises from the family crypt – after having been interred there whilst still alive – and claims her deadly vengeance upon her brother Roderick. In Charlotte Brontë’s novel Jane Eyre, the violently insane Bertha Mason has been imprisoned in the attic of Thornfield Hall, literally bound by chains and guarded. Described as a “beast”, a “wild animal”, a “monster”, and likened to “the foul German spectre – the vampire”, the insane first wife of Edward Rochester represents the darkest and most dangerous of family secrets. Literary critics Sandra Gilbert and Susan Gubar, in their study of women writers entitled Madwoman in the Attic, draw a provocative parallel between the characters of Jane and Bertha in Brontë’s classic novel. They suggest that Bertha represents the “truest and darkest double” of Jane, embodying all of the wild, destructive passions that the genteel Jane consciously rejects. She can be likened to the wild, tangled vines that grow spontaneously from the chairs and bedposts in my Dollhouse, or the snakes that magically slither out from the folds of the bed sheet. Forced to dwell in the shadows of the attic for years, she reemerges into the light with an unchecked fury. The wild randomness of her actions, much like my snakes and vines, disrupt the social niceties occurring elsewhere in the house, serving as a forceful reminder that hidden secrets will inevitably “see the light of day”, and that the repressed will always return.